MHUB PRO HDBaseT matrix system with HDCP 2.2 - supporting 8 x UHD 4K HDR HDMI sources, IP-to-IR + 2-way IR control, multi-channel audio and PoE up to 70m over Cat6 cable to 8 x screen locations. Sold as a complete package inc. all IR cabling and receivers. Available with Scaling receivers. 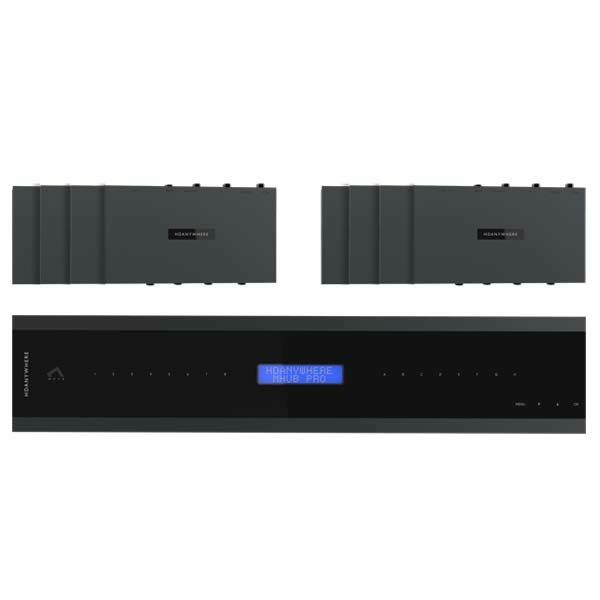 Uses advanced HDBaseT long-range signal technology, which doesn’t introduce any degradation in audio/video quality, even at Ultra HD Blu-ray playback resolutions and supports all audio formats, up to and including Dolby Atmos and DTS:X for the most immersive AV experience possible today. Via your phone or tablet using HDA’s free to download Universal IR Remote App – uControl, which is programming-free and super-simple to setup. You can control not just your source devices but also any connected displays, as well as, of course, simple source switching of the MHUB. Use your voice to control the MHUB PRO with Amazon Alexa, enabling multiple commands to be sent all from a simple voice command. Alternatively, you can use forwards and backwards IR control with the included IR kit, ready-made drivers are also available for all major control systems free of charge.